Two decades ago, work began on the first new fully illuminated Bible to be created in centuries. Each of the roughly 800,000 words of the Holy Scriptures were gracefully written by hand, and artists used their gifts to illuminate the words beautifully. Father Michael Patella who oversaw much of the process explains, “The illuminations are not illustrations. They are spiritual meditations on a text.” The illuminations shed light through a visual medium on the depths of what the scriptural witness. You may have seen reproductions of the original Saint John’s Bible proudly on display in our local hospitals or in your churches. Grace Lutheran where I serve will soon be dedicating our new set that will remind us of the beauty and centrality of God’s word in our life together. I was surprised to find all seven volumes prominently on display in a waiting room at Marquart Toyota while getting my car serviced. You may have also seen prints of the illuminations framed and adorning the places where you worship. Many churches in our area have included this visual witness to God in their buildings. Eau Claire is but one example of the extensive presence that this project enjoys. We have reached a time when scholars have begun to reflect on the contribution that The Saint John’s Bible has made to the life of the world. On Saturday, February 16th at 3:30pm Grace Lutheran Church will hold a free, public lecture by such a scholar. 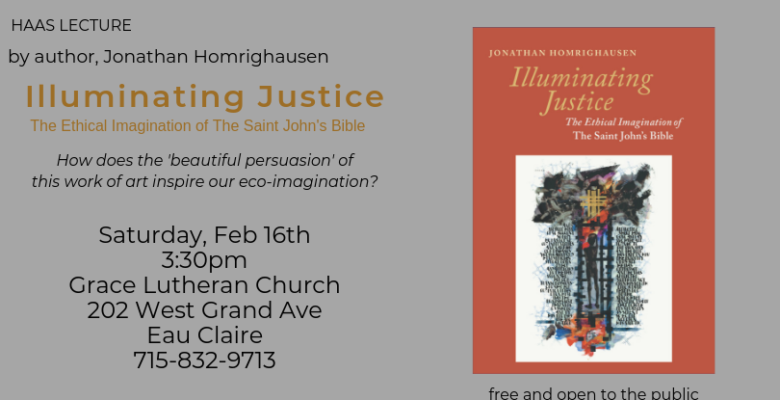 Jonathan Homrighausen, the author of Illuminating Justice: The Ethical Imagination of The Saint John’s Bible, will speak about the “beautiful persuasion” of this particular Bible and how it might inspire our ecological imagination, encouraging us to care for God’s good creation. 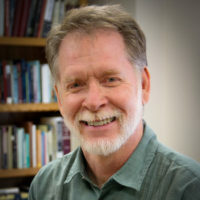 This is part of The Haas Lecture Series that honors Leonard Haas, the former Chancellor of UWEC and a member of Grace Lutheran who taught the value of lifelong learning. 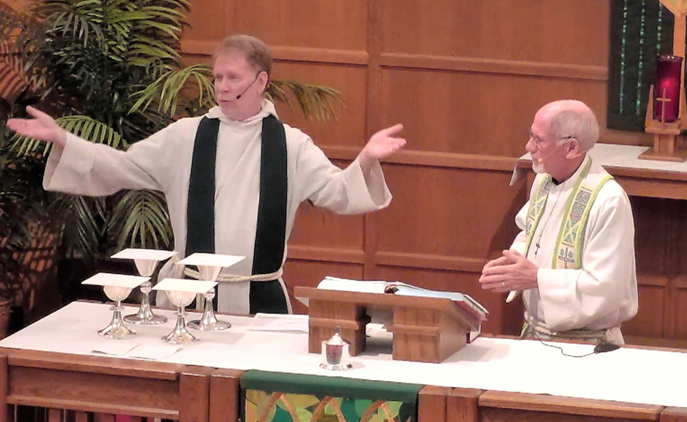 The blessing of Grace’s new volumes will take place the following day during the 10am service. Please join us for these events.